After a long hiatus from blogging, I decided to try this again. I was able to load this image with no problems. Hopefully this will continue and I can keep making posts. This is probably my favorite image made during Sarah and my trip through the Shawnee region of southern Illinois this spring. Seeing some spectacular images online of this place, I couldn’t wait to get here. Garden of the Gods is located on the eastern side of the Shawnee, so this was our “final destination” as we progressed further from StL. And although we did see some nice spots, like Bell Smith Springs and Burden Falls, during this rather dry spring, GoG turned out to be the paramount stop. We arrived with less than 30 minutes of light left during the first evening. We only saw a limited view of the exposed rocks and watched a pretty nice sunset, but had no real time for or notion of how to set up for a photograph. We drove back to the very nice cabin we had located near Eddyville, about a 30 minute drive from GoG, and stayed the night. I got up well before dawn and arrived back at GoG about a half hour before sun rise. Although I was not fortunate enough to be able to capture a spectacular sunset or sunrise during our brief visit, I was happy with the light presented the morning I made this image. What I found fascinating is the apparent remoteness of this spot. 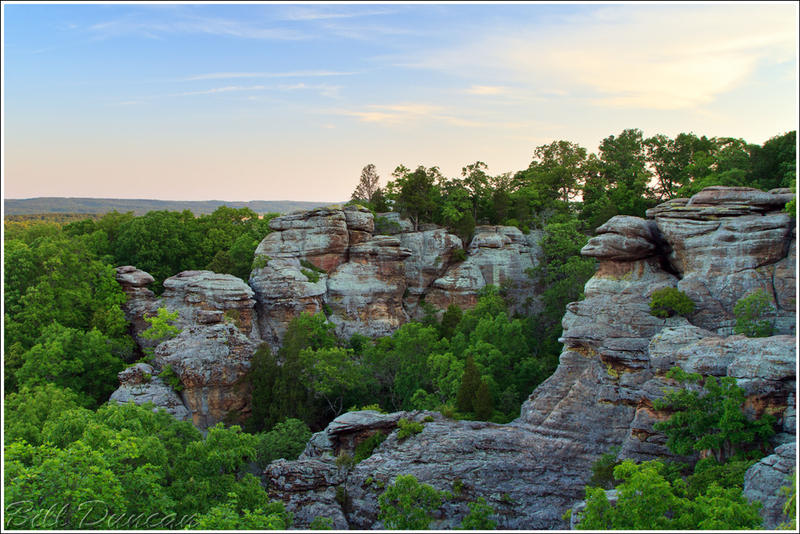 Even though it is only about 30-45 minutes from some decent sized towns, this spot seemed more remote and “out of the way” than most spots I visit in the Ozarks. The morning I made this image I was alone except for one young man who seemed to be in his early twenties. I saw him in the parking lot with nothing but the clothes on his back. There were no other vehicles and he was pacing around acting oddly. I wondered if I should ask him if he needed some assistance or a ride, but something about him was weird. He didn’t seem to acknowledge me, so I didn’t confront him. I’m not sure if I did the right thing or not. I watched him lay down on a bench as I drove away. As I believed I mentioned before, the one nice thing I learned was how close many of these spots in the Shawnee are to StL. GoG is only about 2.5 hours from our front door. For some reason I expected these spots to be a longer drive. I’m definitely excited to make some more visits to these spots and keep tracking that sweet light. Thanks Austin. Unfortunately, it seems I let technical limitations hold me back too often. Me too, glad you’re back! Glad to see you made it to this location.